Dr. John Stremlau views the recent elections held in the Democratic Republic of the Congo as both triumphant and tragic. "It was quite moving to see the Congolese people turn out to vote," he said. "At the same time," he added, "it was depressing to see how the country and its people have suffered so greatly." The elections were the first held in 46 years in a country devastated by five years of civil war where more than 3 million people have died, mostly from disease and malnutrition. 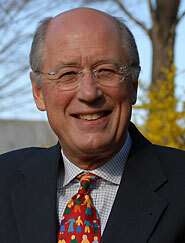 Africa is familiar territory to Dr. Stremlau, associate executive director for peace programs at The Carter Center. He began his career in Nigeria, producing a book on that country's civil war, continuing to work on African issues during stints as head of international relations at the Rockefeller Foundation and deputy director for policy planning at the U.S. Department of State. When he was hired at the Center in early 2006, Dr. Stremlau had been living for eight years in Johannesburg, South Africa, teaching at the University of the Witwatersrand and heading its Department of International Relations. His recent South African experience has given Dr. Stremlau renewed hope for Africa's future. "People want to debate in South Africa," Dr. Stremlau said. "The country has used peaceful means to overcome the political and social challenges that stem from the legacy of apartheid," he added. South Africa is also playing a vital role in helping promote peace and democracy in the Democratic Republic of the Congo and in other conflict-prone areas where The Carter Center has programs in the areas of peace and health. The social climate in his adopted South Africa also has made the transition to The Carter Center smooth for Dr. Stremlau. "Like The Carter Center, South Africa likes to be inclusive. You don't leave people outside the tent," he said. And in these times when support for the United States around the world is low, Dr. Stremlau is pleased to be part of the Center. "You cannot exaggerate how important the image of The Carter Center is as a reflection of the better side of America's nature," he said. "President Carter is seen as someone who genuinely respects and likes the people of Africa and cares about their troubles." As the Center's peace programs evolve, Dr. Stremlau has put forth a slogan to guide his programs' work: peace with justice. "Peace alone is not enough. There must be a sense of fairness and justice for people to play by agreed rules and not revert to violence," Dr. Stremlau said. "The peace programs have as their core concern the commitment to promote fairness as the foundation for building hope," he said. In this vein, the work of the peace programs will have a renewed emphasis on human rights, which has been a consistently strong undercurrent of all of the Center's work. Plus, the Center plans to focus on helping countries truly build democracies by not only monitoring elections but by maintaining a presence in countries for the long term-before and after elections. Atlanta, Ga., may be a long way from South Africa geographically, but Dr. Stremlau already has become comfortable. "The Carter Center has a small staff and a huge agenda," he said. "There's always plenty to do." 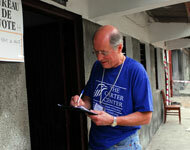 John Stremlau completes an observation checklist at a polling site in the Democratic Republic of the Congo in July.